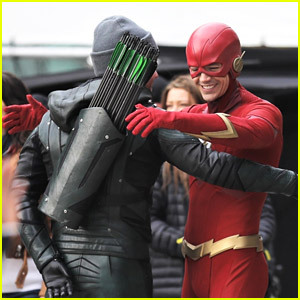 Stephen Amell and Grant Gustin hug it out on the set of the upcoming Arrowverse crossover in Vancouver, Canada on Tuesday (October 23). The two DC Universe stars were joined by co-stars Melissa Benoist as Supergirl, Jesse Rath as Brainiac 5, and Tyler Hoechlin as Superman. Elizabeth Tulloch, who will star as Lois Lane in the crossover, was also seen on the set. The crossover, titled Elseworlds, will also introduce Ruby Rose as Batwoman to the franchise. Malin Akerman & Jack Donnelly Step Out for Grand Opening of Raspoutine Los Angeles Club! Chace Crawford & Tyler Hoechlin Are Studs at Golden Globes After Parties! 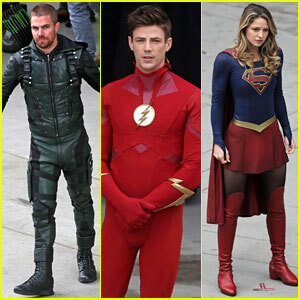 Stephen Amell, Grant Gustin, & Melissa Benoist Film Scenes for 'Arrowverse' Crossover! 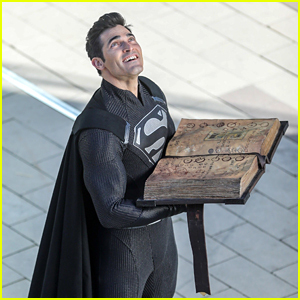 Tyler Hoechlin Wears Black Version of Superman Suit on Arrowverse 'Elseworlds' Crossover Set! Alexandra Daddario & Tyler Hoechlin Hold Hands On Set of New Rom-Com Movie! Tyler Hoechlin Goes Shirtless in New 'Bigger' Trailer & Stills! Nicky Hilton, Tyler Hoechlin & Ian Bohen Step Out for amfAR Paris Dinner 2018! 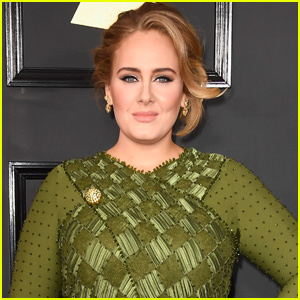 Penelope Cruz Launches Jewelry Collection with Atelier Swarovski! Nicky Hilton Buddies Up with Tyler Hoechlin & Ian Bohen at Dundas Fashion Show! Rising Stars Nick Robinson & Harris Dickinson Are Dapper Dudes at Golden Globes After Party 2018! Tyler Hoechlin Wears Tiny Swimsuit for 'Bigger' Beach Scene with Julianne Hough! Fifty Shades Freed's Steamy Trailer Brings Jamie Dornan & Dakota Johnson Back Together - Watch Now!